Before moving into their recently-purchased home in Wisconsin, homeowners Joe and Sara H. decided to do some renovations. Tops on the list? 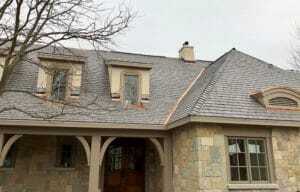 Replacing an older asphalt shingle roof with a synthetic slate roof from DaVinci Roofscapes. The home remodel project is being undertaken by Lowell Custom Homes in Lake Geneva, Wisconsin. For the team there, this was the first time they had worked with DaVinci products. “We provided the homeowner with several roofing options,” says Rich Kinter, general manager of Lowell Custom Homes. 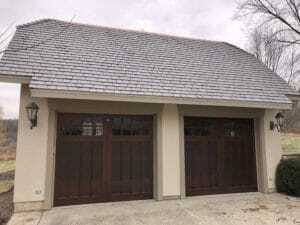 “They felt the DaVinci synthetic slate tiles were the most realistic for their home and detached garage.